San Francisco Giants reliever Sergio Romo gave us a sneak preview of last night’s historic election results. Last night’s election results revealed to masses of people that this is a fundamentally different country than they perceive from the alternative reality constructed by Rupert Murdoch and Rush Limbaugh. It’s defined less by the narrow hatreds of the powerful than by a younger generation that’s more diverse, more open, more courageous and, frankly, more interesting than those at the levers of power. The sports world reflected this real-world reality in full force last week in the person of Sergio Romo. Others in immigrant rights circles were deeply disturbed by Romo’s shirt. Any use of the word “illegal,” they argued, should be condemned. But using humor to puncture racism is as old as racism itself. Romo’s incorporation of “the i-word” isn’t about legitimizing the word but mocking it. Romo’s shirt seems to have inspired the people fighting to make such a shirt a relic of history. The civil rights group Alto Arizona has even set up a website aimed at sending Romo a thank-you. Then there is the context of a Major League Baseball player wearing such a shirt. Baseball is now built upon a foundation of Latin American talent. This has led to real tensions between states that have adopted deeply punitive immigration policies aimed at making life unbearable for Latino residents and the players on their home teams. This reached its apex when the home of the infamous anti-immigrant law SB 1070, Arizona, hosted the 2011 All-Star Game. MLB Commissioner Bud Selig wouldn’t stand up for his players or the civil rights traditions of his sport, in letting the state Jan Brewer and Sheriff Joe Arpaio host the game. Players and fans protested, but Selig chose not to listen. Sergio Romo reminds us that the people beneath the uniform are human beings, just like the people politicians and nativists scapegoat and target for narrow political gain. For that, I agree with Alto Arizona. Sign me up to say thank you to Sergio Romo. 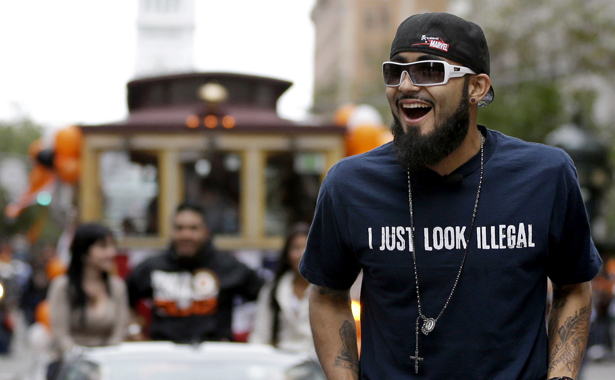 Sergio Romo was brave enough to spark a conversation that needs to be had. This is different country than even ten years ago. It’s becoming more open, more tolerant and more impatient with anyone who would dare call another human being “illegal”.